↑ Lewison, R. & Oliver, W. (IUCN SSC Hippo Specialist Subgroup) (2008). Hippopotamus amphibius. In: IUCN 2008. IUCN Red List of Threatened Species. Downloaded on 2008-06-30. Database entry includes a brief justification of why this species is of endangered. ↑ Laws, Richard (1984). Macdonald, D., ed. The Encyclopedia of Mammals. New York: Facts on File. pp. 506–511. ISBN 0-87196-871-1. ↑ ἱπποπόταμος, ἵππος, ποταμός. Liddell, Henry George; Scott, Robert; A Greek–English Lexicon at Perseus Project. ↑ "Hippopotamus". Merriam-Webster's Online Dictionary. สืบค้นเมื่อ 2007-07-18. ↑ 5.0 5.1 5.2 "ฮิปโปโปเตมัส". สวนสัตว์เชียงใหม่. สืบค้นเมื่อ 20 January 2015. ↑ "Hippopotamus". sandiegozoo. สืบค้นเมื่อ 20 January 2015. ↑ 8.0 8.1 Eltringham, S.K. (1999). The Hippos. Poyser Natural History Series. Academic Press. ISBN 0-85661-131-X. ↑ "11 นัก 'กัด' สุดแรงที่ไม่มีใครอยากลองดี". animals.spokedark.tv. 24 September 2013. สืบค้นเมื่อ 20 January 2015. ↑ 10.0 10.1 "Hippo Dung Threatens Fish in Kenya River Studied With Crocodile Boats". guardianlv.com/. 28 May 2014. สืบค้นเมื่อ 20 January 2015. ↑ "เจ้าของถูกฮิปโปที่เลี้ยงไว้ขย้ำจนเสียชีวิตในแอฟริกาใต้". สนุกดอตคอม. 14 November 2011. สืบค้นเมื่อ 20 January 2015. 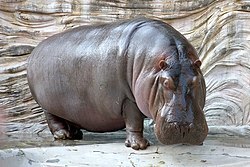 "Hippos: Wildlife summary". African Wildlife Foundation. หน้านี้แก้ไขล่าสุดเมื่อวันที่ 15 กันยายน 2561 เวลา 22:32 น.